An alternative to an accent wall, try an accent door for a pop of colour that won't overwhelm a space. Shown is CIL's Egyptian Earth (70YR 19/557). The tiny house phenomenon is one that has gained a lot of steam recently. It has been documented on TV and in film, through shows like Tiny House Nation or documentaries, as well as all over the Internet. Some are choosing to live in smaller spaces to minimize their ecological footprint or just to delete the clutter from their lifestyle. One thing the tiny trend contributes to our discussion of condos is a new way of rethinking space-saving design or design on a spatial budget. Minimizing your space and maximizing your design creativity come hand in hand. This is a great lesson to take away from the tiny house trend and adapt to condo living. Of course, a condo is not necessarily a small space. However, moving into one is often a lifestyle choice associated with downsizers or young people moving into their first grown-up homes. So let’s discuss some unique design elements that can change a condo radically, augmenting its square footage to optimize space. Pinterest is a great source for trend spotting and design hunting. A recent search led me to an exciting idea. You’ve heard of the accent wall, a brightly hued focal wall in an interior space — well how about an accent door, a pop of colour restricted to a smaller area? I’ve never been a real fan of the accent wall as it is tricky to pull off. 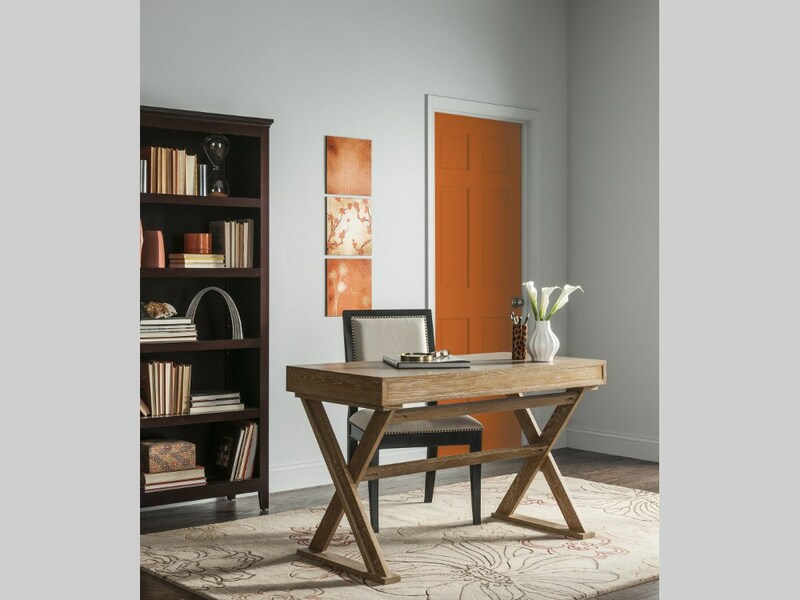 The accent door is, similarly, not for the faint-hearted, but design mavens and ahead-of-the-gamers will enjoy its bold statement and fun flair. In a smaller space like a condo, a little colour will go a long way, so an accent door is plenty in the way of a colour pop. Be sure to match with in-room accessories of the same hue. Sometimes, window treatments can make a room look cluttered. This is especially true of fabric drapes and blinds. Installing frosted glass in rooms where the windows would often be covered is a great way of cutting down on expense and clutter. You may consider frosting the glass in your bathrooms, thereby protecting yourself against prying eyes while still maintaining natural light. If your unit is high off the ground and does not face other units, you may even decide to install just a bottom row of frosted glass and leave clear glass panes for the rest of the window. This can be a stylish, private design. Who says curtains are just meant for windows? If you aren’t able to keep a separate office area, you may choose to keep it hidden away behind curtain panels for easy access in a high-traffic area. For instance, if you have a small desk in your hallway or kitchen, you can mount a curtain rod along the wall, behind which your desk can lie in wait. That way, you won’t have to look at a mess and be reminded of your work to-do list. Sophisticated panels come with oversized grommets and textures and colours that can be ordered to match your furniture. When appropriately dispersed throughout a condo, mirrors can make a small space feel and look more expansive. Try a trio or quartet of identical mirrors mounted equidistance apart on a windowless wall. This mirror display will not only expand your sightline, it will also maximize light in the room. Let’s assume your condo has minimal square footage. Counter space and floor space may be overpopulated by lamps, furniture, appliances and other things, but there is one angle you may be overlooking: wall space. There are many unique ways you can optimize your walls for storage. Consider designing an alcove or two, which can be a stylish way of storing your favourite items. Vases, artwork and other items will look elegant and striking tucked away in your alcove. Of course, there are subtler and less expensive ways of tapping into your wall space. One is by building in storage units. Try installing one by the front door for your mail and keys or go for a wall-mounted unit that stores wine bottles horizontally. Items like this are not only unique conversation starters with guests, but also elevate storage to art. There are many ways to arrange your condo so that it feels more spacious. All it takes is a little creativity. Marilyn Wilson has been selling real estate for more than 24 years and owns Marilyn Wilson Dream Properties Inc. Brokerage, an Exclusive Affiliate of Christie’s International Real Estate. She can be reached through dreamproperties.com.